3. I am trying to eat every 2-3 hours as suggested by the trainer and health experts. 3. And I am trying to fix a more balanced and copious breakfast which includes a bit more carbs than what i have been eating. As suggested, I am trying to eat more proteins and more carbs. So this week my breakfast has essentially been 3 white scrambled eggs, and oatmeal. 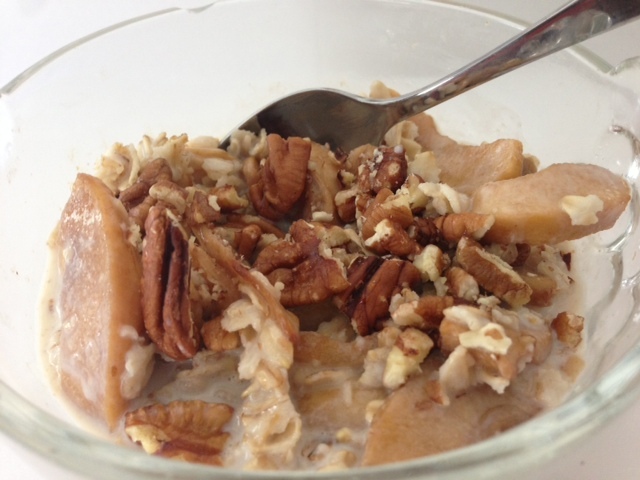 Oatmeal has never been a favorite of mine, but I always have some at home, because it makes for a quick balanced breakfast if nothing is around. I have always cooked it with milk and added fresh fruit to it which gets boring quite fast. This week, having more time, I have been playing with various ingredients to make this boring oatmeal much more pleasing to my tastebuds. Yesterday, I used fresh coconut, today I used apples. 1 apple peeled and sliced. Turn the oven to 475. Place the sliced apples into a bowl and sprinkle 1 tbsp of the Muscovado brown sugar and some cinnamon if you want. Stir to coat the apple slices with the sugar and cinnamon. Empty those apples sliced onto a deep flexipat that you would have placed on a perforated sheet. Place the pecans on the other half of the pan so that they will roast as the same time as the apples will bake. Cook both in the oven for 5 minutes. Meanwhile prepare the cooked oatmeal. Place the oatmeal, and the milk into a medium-sized bowl and cook the oatmeal for 3 minutes in the microwave.Watch that the milk does not boil over. It will start rising at about 2 1/2 minutes. Add the vanilla, and a pinch of Cinnamon. 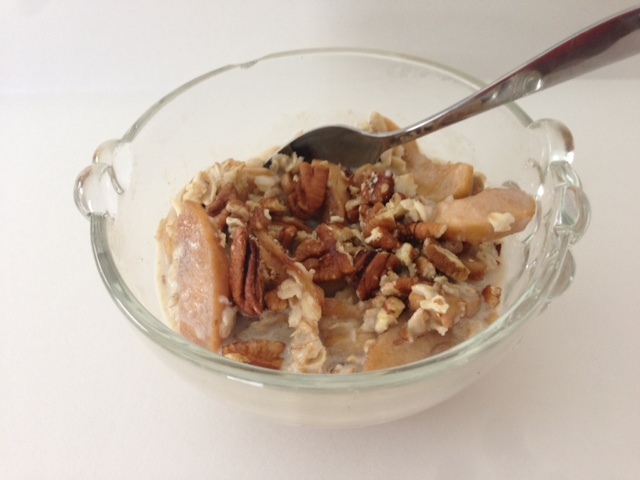 Divide the oatmeal equally in 2 or 3 portions in individual bowls. Then add the cooked apples. Mix and drizzle some maple syrup. 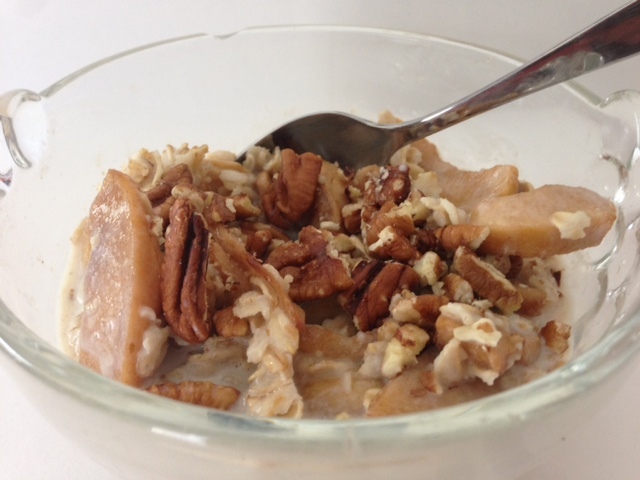 Break the pecans in small bit and sprinkle them on top of the oatmeal. Et voila!! !